You just haven’t met him like this yet. Michael Bublé and his tour crew come to the big screen for one night with “Michael Bublé – Tour Stop 148” on Tuesday, September 27 at 7:00 p.m. local time. This special cinema event closely follows Bublé’s dedicated team on the road and features a selection of his greatest hits on stage, including “Home,” “Crazy Love,” “Cry Me A River,” “Feeling Good” and more. In addition to the feature content, audiences will also enjoy a specially-filmed introduction and Q&A with Bublé which addresses his motivation for making the film, his music and his experience of life on the road. Tickets for “Michael Bublé – Tour Stop 148” can be purchased online beginning Friday, August 12 by visiting www.FathomEvents.com or at participating theater box offices. Fans throughout the U.S. will be able to enjoy the event in more than 350 select movie theaters through Fathom’s Digital Broadcast Network. For a complete list of theater locations visit the Fathom Events website (theaters and participants are subject to change). "Along with giving my fans a front row seat to the show, I really wanted to celebrate the incredible backstage team. They're the 'unsung' heroes who bring this show to a new city every night. I could not have done it without them," said Bublé. Canadian superstar Michael Bublé has left an indelible mark on the entertainment world. His music has earned him numerous Grammy and Juno awards. He has sold more than 55 million albums worldwide and more than two million tickets for the To Be Loved Tour. 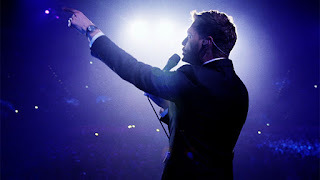 “Michael Bublé – Tour Stop 148” gives his legions of fans not only a front row seat to breathtaking concert performances of his greatest hits, but also an exclusive look at what goes into a concert tour of this magnitude – where the crew becomes family and the camaraderie is unmatched. “Michael Bublé’s reputation as the consummate performer who gives the audience all he’s got is on full display in this cinema event, along with the efforts of the incredible team that surrounds him while moving this lavish production from city to city,” commented Dion Singer, Executive Vice President, Creative at Warner Bros. Records and Executive Producer of the film.